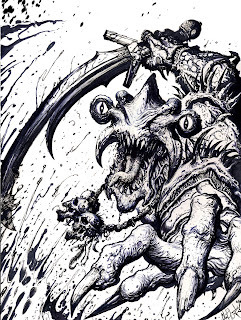 Greg Staples - Hail to the Chief! Every now and then a cover comes along that makes you gasp, and the cover of Prog 1690 by the amazing Greg Staples did just that! 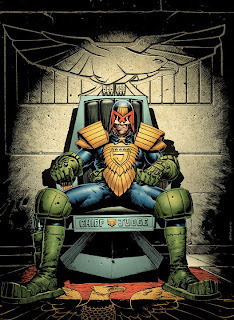 I gasped partly because of how drokking amazing the image is and partly because, after turning the job down so many times, Dredd as Chief Judge is surely something that none of us ever thought we'd ever see! 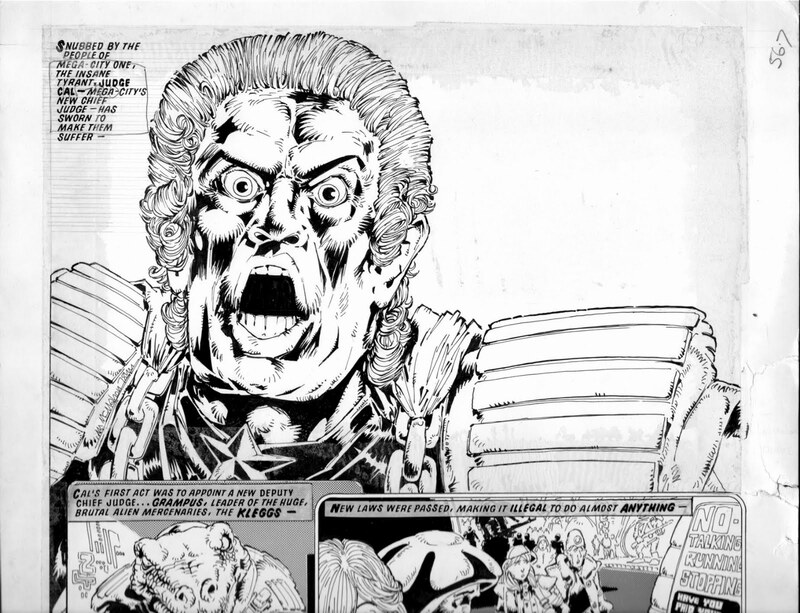 Staples is an absolute legend who has had a meteoric rise to fame since his first 2000AD cover for the Dredd tale Babes in Arms way back in 1992. Now every cover he does is an 'event' cover and this is certianly no different! 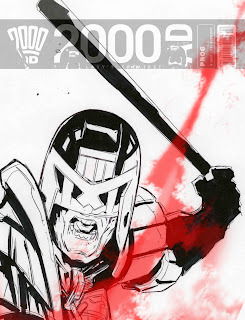 And another cover we thought we'd never see - Dredd bonking from Megazine 3.69, Grud on a Greenie! And a no nonsense gunshark blowing you away cover from 2000AD Prog 1153 proving (yet again) that Greg is the king of cool covers! 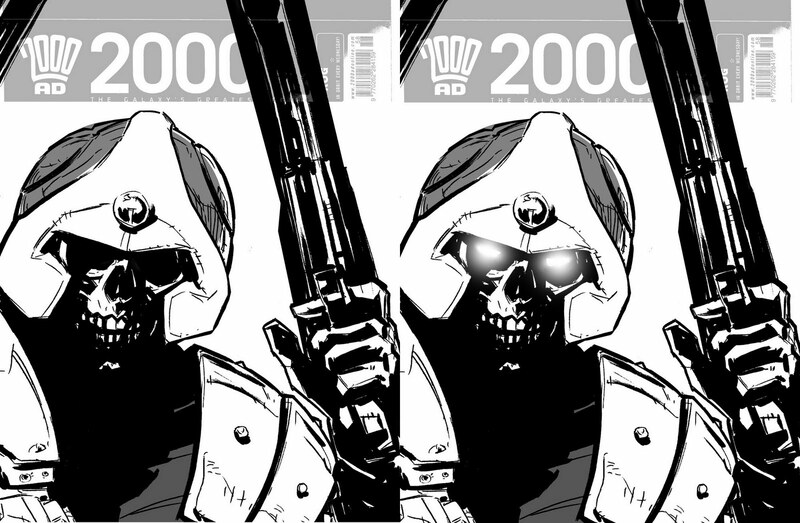 Everything we've seen of this project to date looks drokking amazing and it's fantastic that one of 2000AD's most respected artists is playing it's greatest character! I can't wait to see it! Remember you can see more of Greg's sublime work elsewhere in this blog and on his swanky NEW website here. Thanks to Greg for sending the images, they're amazing! 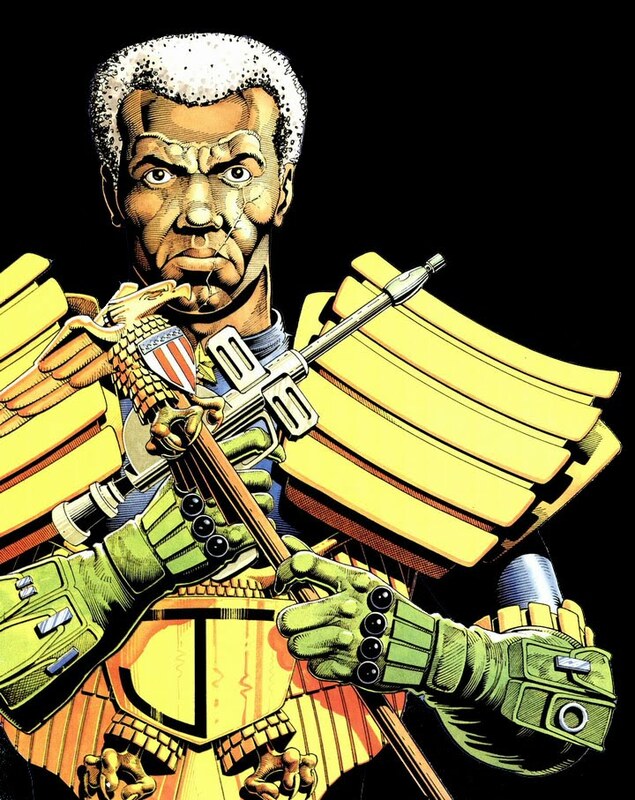 The first Chief Judge was, of course, the great Eustice Fargo, Dredd's clone father and visionary pioneer of the Judicial System of Megacity-One. Fargo created a formidable police force built on impeccable standards of discipline and conduct, including enforced celibacy. Unfortunately, Fargo himself broke this rule and was so ashamed, he attempted to shoot himself, resulting in terrible mental and physical damage. 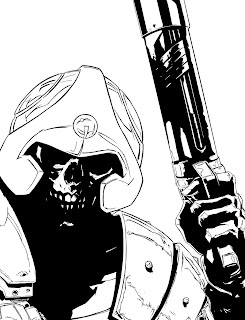 He was put into suspended animation until science was able to cure his terrible wounds only to have his body was stolen by renegade judges who fled to the Cursed Earth. Last words: "My flesh, my Blood... It's not too late! Fix it. Joe! You - You and Rico - You can do it..."
Soloman was succeeded by Clarence Goodman, the city's longest ever serving Chief Judge. Goodman, and his newly formed council of five, were instrumental in moulding the course of history during significant political and geographical upheaval in the United States. Such events include the Atom War of 2070, the formation of the three American Megacities, sanctioning human cloning from esteemed judicial stock, averting a civil war with Texas, the first robot war of Megacity One and the 2T(fru)T outbreak in MegaCity Two. 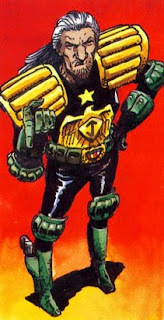 Goodman was a popular figure and a staunch supporter of Dredd. 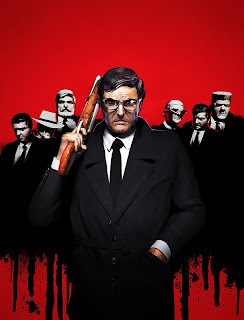 Sadly, after more than forty years in office, he was brutally murdered on the orders of the notorious Judge Cal. Final Words: "Put away those knives. You're breaking the law!" 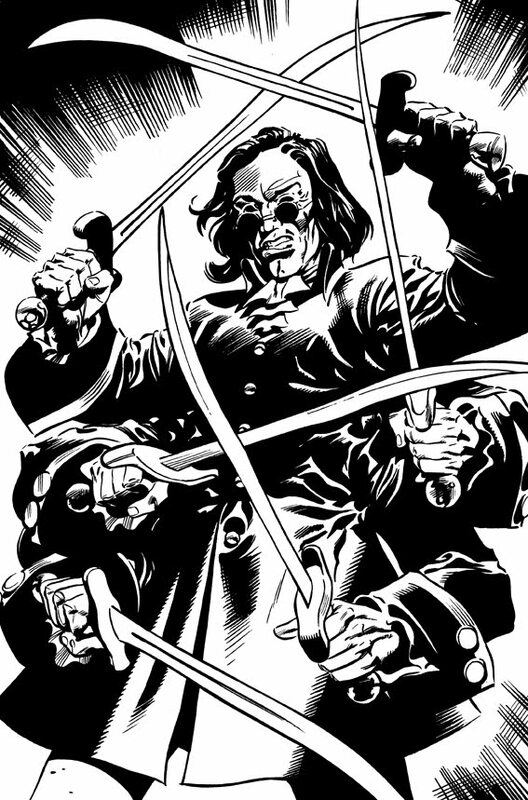 Most infamous of all chief judges was the deranged Judge Cal, who tyrannical reign saw some of the cities' darkest days. 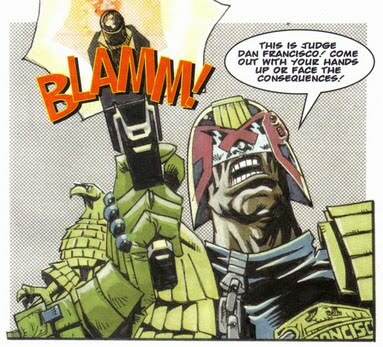 Head of the SJS, Cal assumed the position of Chief Judge by framing Dredd for murder and ordering the assassination of Chief Judge Goodman. 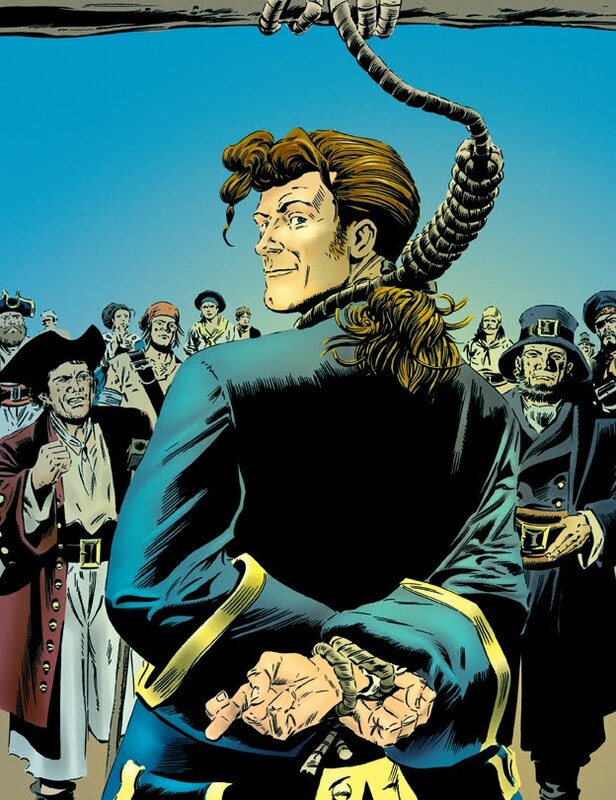 Once in power, he used hypnosis to brainwash the judges to carry out his orders before terrorising the city with his ever more insane schemes. 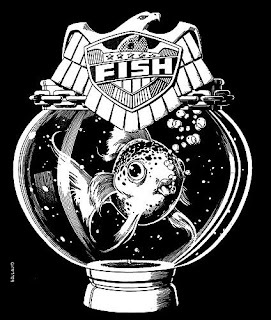 These included making his goldfish Deputy Chief Judge, building a huge wall to keep citizens trapped within the city, hiring an alien race of mercenaries known as the Kleggs to help in his oppression of the citizens before finally sentencing the entire city to death. 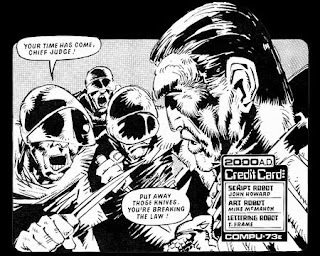 Dredd, with the help of a rag tag bunch of Judges, Judge Tutors and an Undercity dweller known as Fergee, eventually overthrew the maniacal dictator. Last words: "I only have to command and our fall will stop! Observe mortals! Observe my powers! STOP!" Following Cal's reign, the shamed judges begged Dredd to be Chief Judge. 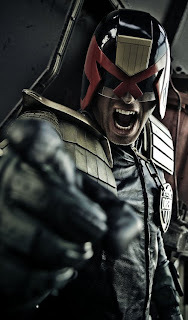 Dredd flatly refused, claiming his place was on the streets. Instead he suggested that Judge Griffin, former principal of the Accademy of Law, take the role. Griffin's time as chief was fairly short, but extremely eventful. Following the Blockmania epidemic he was captured by invading Sov forces and brainwashed to be used as a propeganda tool for the invading Soviet army during the Apocalypse War. 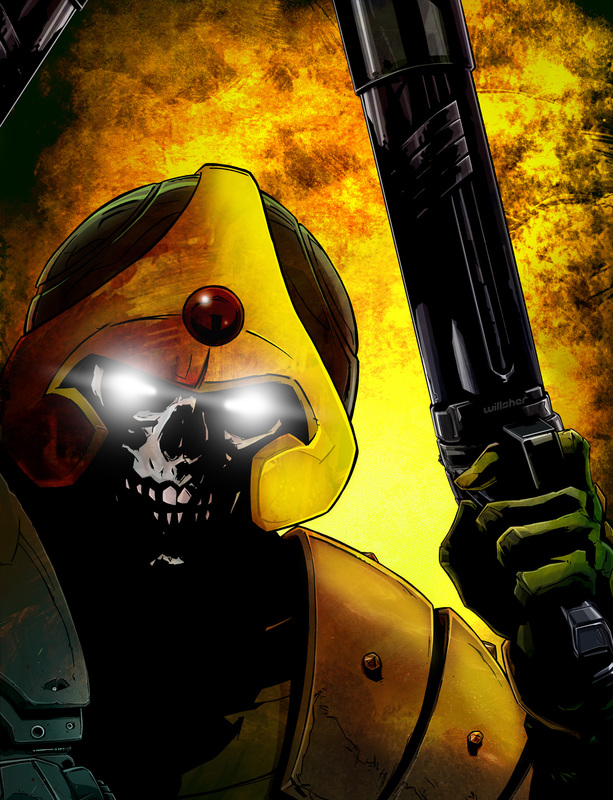 Dredd himself infiltrated the Sov base and assassinated his former mentor. Last Words: "I-I've betrayed my city! I deserve to die!" Last Words #1 "It'll be good to see some action again. Still, I'm going miss it!" Before leaving, McGruder appointed the esteemed Judge Thomas Silver onto the council of five and it's members quickly appointed him Chief Judge. A right wing hardliner, Silver ruled with a rod of iron, focusing particular attention on crushing the growing democracy movement. 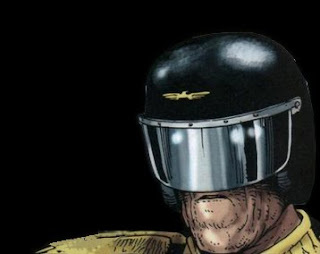 This included putting Dredd in charge of subverting the Democratic March of 2109. Dredd's questionable actions that day left a bitter taste in his mouth that would eventually grow to significant doubts in the Justice system that he'd held so dear. Dredd's misgivings finally consumed him when a young boy was murdered by a man who had been mentally damaged as a result of the brutality shown at the march. Dredd took the long walk, turning his back on a system he no longer believed in. One of Dredd's final acts before leaving the city was to fail a young cadet known as Kraken in his final assessment. Kraken was a clone of Judge Fargo who had been part of a twisted cult known as the Judda, led by the evil Morton Judd. 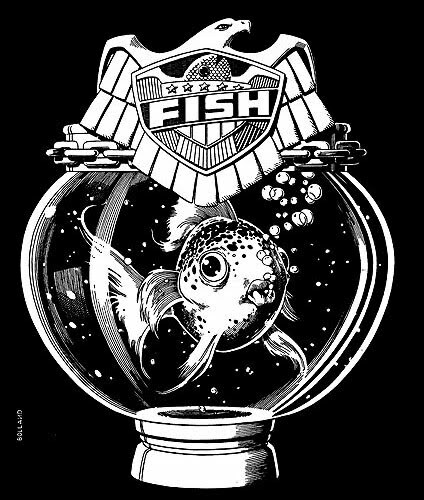 Silver ordered a cover up Dredd's departure and repealed his judgement of Kraken. 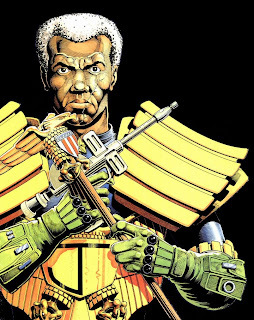 He made the young judge to take the mantle of Dredd, fearing that the Justice Dept would lose respect if the citizens knew Dredd had gone. Years of twisting and indoctrination of Kraken's psyche had left his mind vulnerable and open to suggestion. 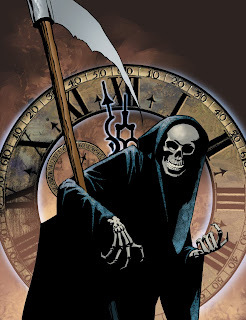 This was exploited when the great city was attacked by the powerful, supernatural Sisters of Death, who made the young judge a puppet to their evil schemes. Kraken was made to help the sisters form a psychic bride to the MegaCity and also release the four dark judges, bringing on the tragedy known as Necropolis. 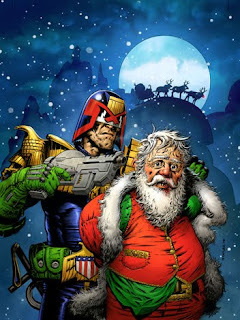 Sensing that his city was in great danger, Dredd returned to see if he could help. On the way, he met a mad old crone who turned out to be none other than former Chief Judge McGruder. Together they saved the city and in the absence of Chief Judge, McGruder reclaimed the role. 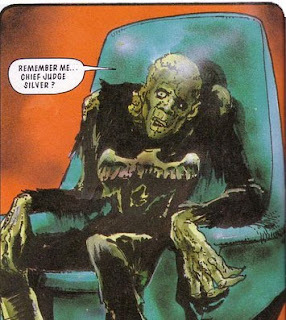 However, some weeks later, the reanimated corpse of former Chief Judge Silver returned to the city and challenged McGruder to the position of Chief Judge. 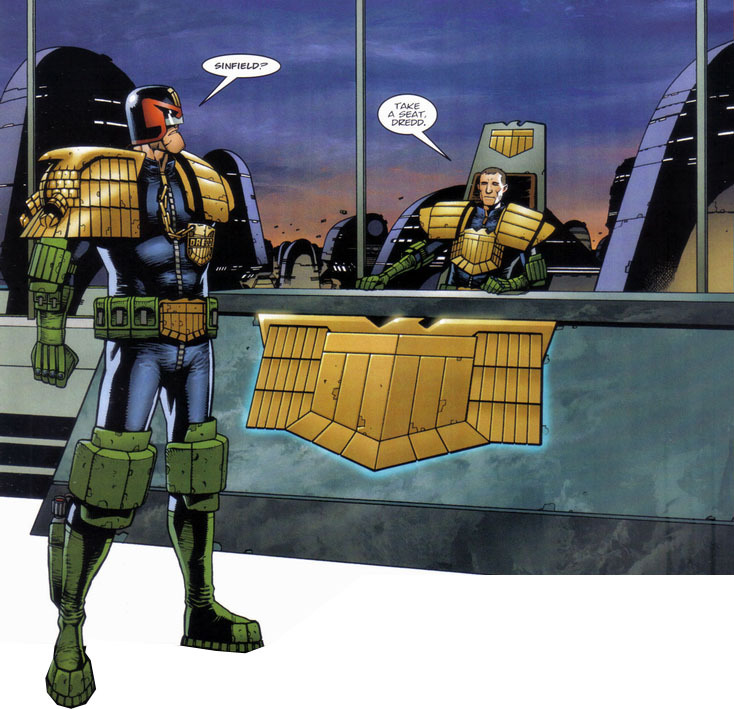 He told Dredd how he had been killed again and again by Judge Death and had fled when the crisis was averted. 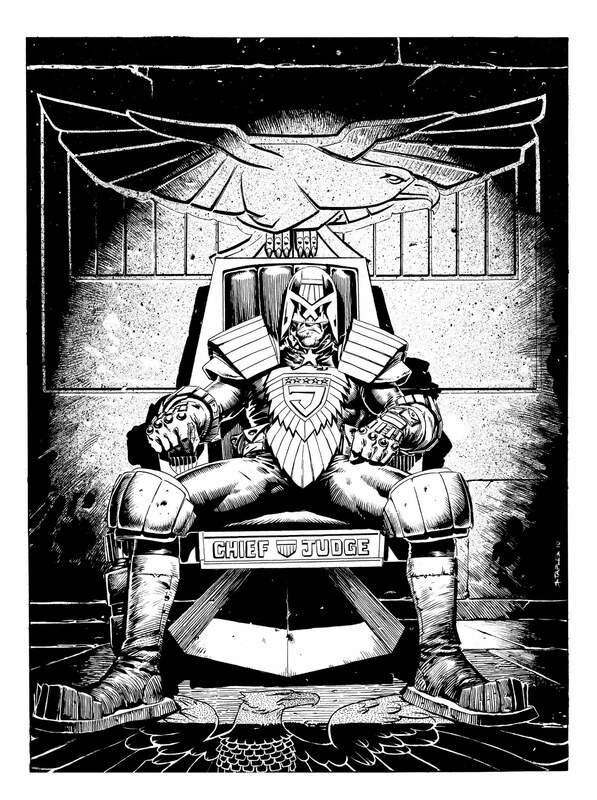 Dredd convicted Silver of gross dereliction of duty and sentenced him to death, finally putting to rest one of MegaCity-One's most deeply flawed chief judges. Last Words: "No! Not... Please, don't kill me...! Pleassse!" 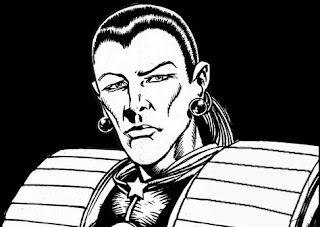 McGruder's second tenure as chief judge ran anything but smoothly, her erratic behaviour and deteriorating mental health resulting in several clashes with Dredd. 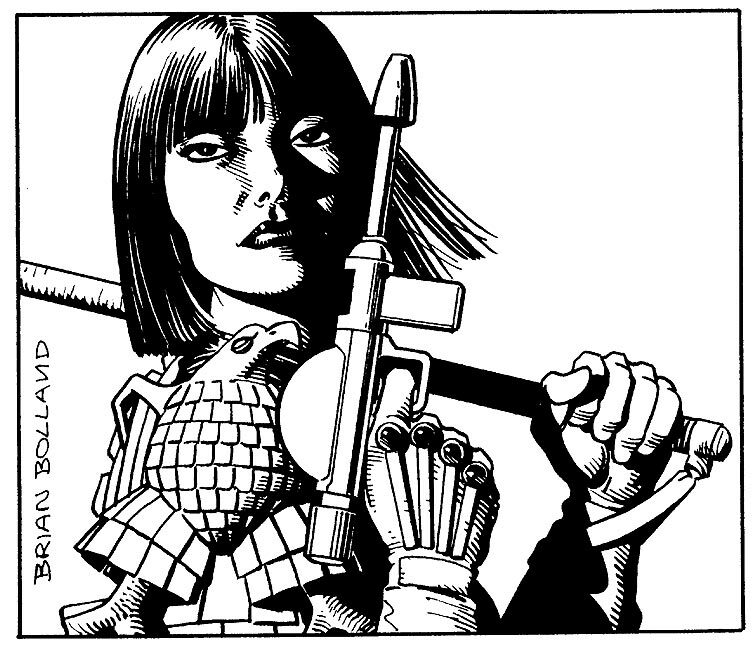 Most notably, her unwavering support of the controversial Mechanismo project, where the streets would be partly policed by robotic judges, caused irreparable damage to her and Dredd's strained relationship. This culminated in Dredd's spectacular arrest for perjury and criminal damage as he had played an instrumental part in the destruction of a rogue Mechanismo unit. Following the events on Hestia, McGruder finally accepted that her judgement was flawed and resigned. This time she declined to take the long walk, instead choosing to embark on a lecture tour to promote her book, McGruder - The Downing Street... oops, I mean McGruder - The Justice Years. 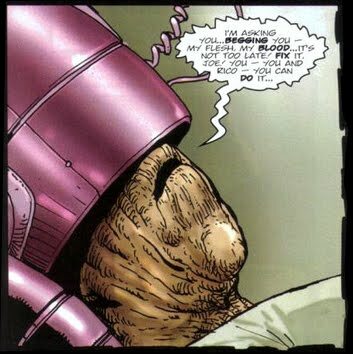 Several years later, suffering heavily from dementia, Dredd took McGruder into the Cursed Earth on one final mission, choosing to give her a heroes death just minutes before her scheduled trip to the euthanasium. Last Words#2 "They were -cough- going to... going to kill us you know..."
The resignation of McGruder led to the judicial election of 2116, where, in the absence of a Council of Five (McGruder had dissolved it), four hundred senior judges would vote for the next Chief Judge. 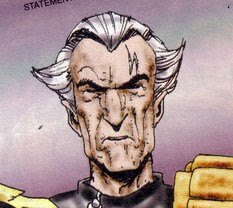 To the surprise of many, Dredd himself stood for election, as did Judges Hershey and Volt among others. 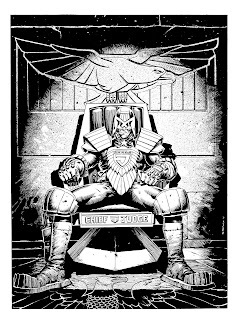 However, it transpired that Dredd's involvement in the election was a simply ruse to expose a corrupt SJS judge who was using his position to discredit the other judges running for office. 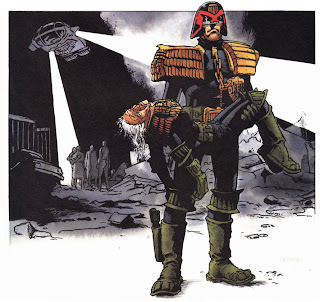 Once the perpetrator was apprehended, Dredd contined to stand for office, though was soundly beaten in the vote by Judge Hadrian Volt who got 208 votes as compared to Dredd's 130. Dredd knew he wouldn't win, and had voted for Volt himself, believing him to be the right man for the job. Of his defeat, Dredd said "I've put too many noses out of joint in my time to win a popularity contest." Generally, Volt was an excellent chief judge who made a variety of sound, sweeping reforms. He re-established the council of five and introduced a Deputy Chief Judge role to the department to ensure that there was a mechanism to legally remove any chief judge who was deemed unfit to rule. In previous years, the image of the Justice Deparment had been severely tarnished following catastrophies such as the reign of Cal, the judges actions during the Necropolis crisis and the farcical rule McGruder. To reconcile this, a degree of political power was shifted back to an elected body of citizens as well as the opportunity for citizens to elect a major. Volt's tenure lasted for five years but was tragically cut short when he commited suicide at the conclusion of the second robot war as he blamed himself for not averting the crisis. (Justice Dept. Approved) Last Words: "It's customary to knock!" Actual Last Words "Yes. Thank you. Keep me informed." Volt was succeeded by Judge Barbara Hershey who had been Deputy Chief Judge, and she was soon voted into office. A respected judge from an early age, Hershey had spent many years serving on the council of five and was known to be level headed, if a little left wing. 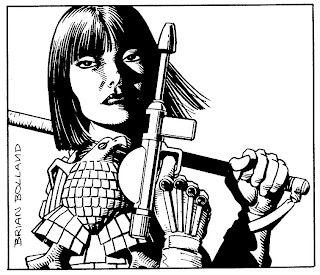 Her period in office lasted nine years but she was eventually voted out for supporting Dredd's infamous Anti-Mutant Laws. Last Words "Goodbye. Good luck." Hershey was replaced by Judge Dan Francisco, a popular Street Judge and star of reality Tri-Vid show, The Streets of Dan Francisco. 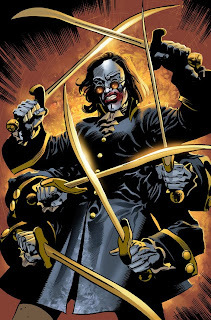 Francisco was backed by a manipulative cabal of senior judges who used the star's popularity to remove Hershey from office and repeal the unpopular mutant laws. During his campaign, Francisco was almost fatally wounded by a group of mutant terrorists (who themeslves had been manipulated by an anti-mutant group), giving the popular candidate yet more support and ensuring he won the election by a landslide. Francisco's injuries were severe and, when his body had rejected a set of prosthetic lungs, power passed to Deputy Chief Judge Martin Sinfield. 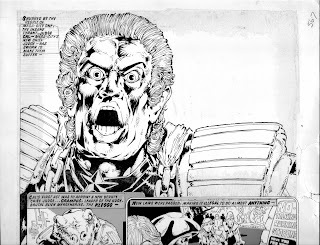 A corrupt, petty and power-hungry individual, Sinfield ensured that Dredd and those closest to him were exiled to the Cursed Earth and that Hershey was posted off-planet. Then, during a hospital visit, Sinfield drugged Francisco with the powerful mind control drug SLD 88, advising him to resign and pass power to himself. 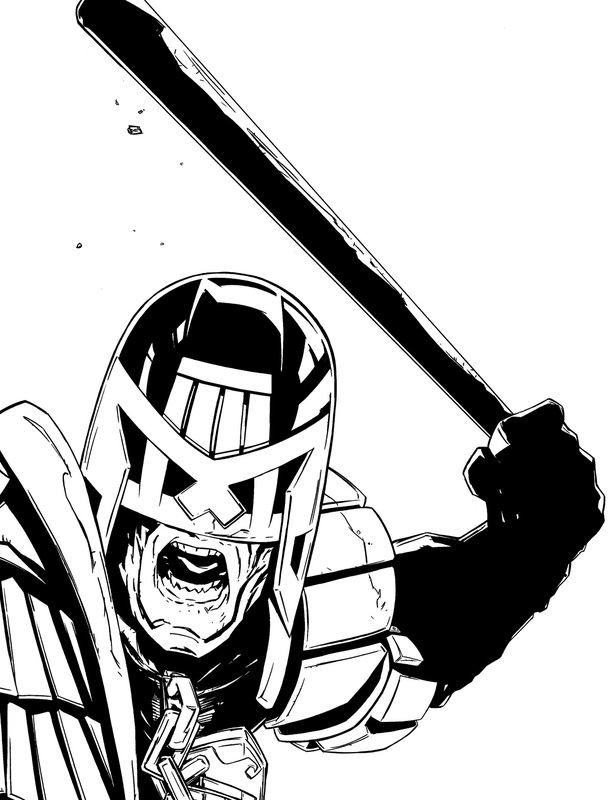 Last Words "I hope you're happy Dredd! You got what you wanted! You're the real criminal! You're to blame for all this! One day they'll get wise to you! They'll see you for what you are!" From his remote posting in the Cursed Earth, Dredd continually clashed with the new chief judge, eventually challenging his authority and running against him in a recall election. However, during the build up to an election, Sinfield's transgressions were discovered and he was sentenced to twenty years hard labour on Titan. Francisco was returned to office and he insisted that Dredd joined the Council of Five, leading to yet another fascinating development in the life of MegaCity One's premier judge! How long will Francisco last? 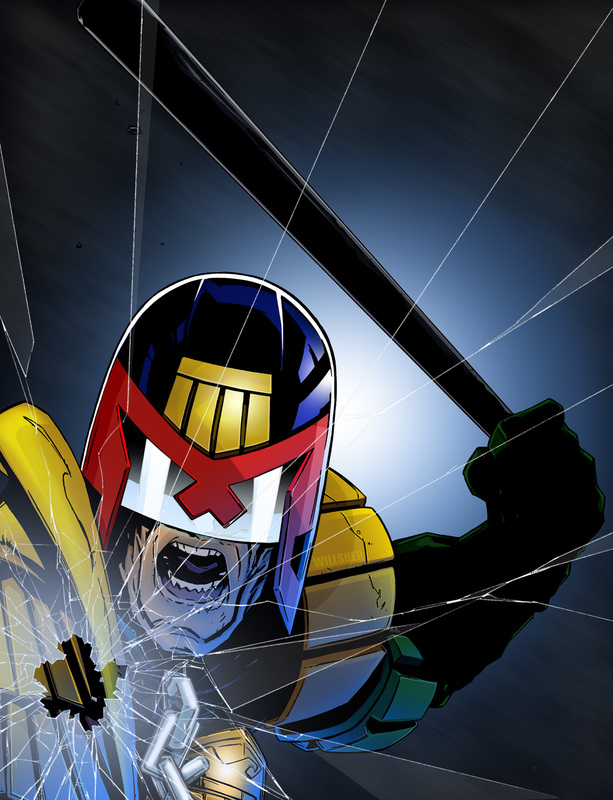 Will Dredd be instrumental in his downfall as he has been with so many others in the role? 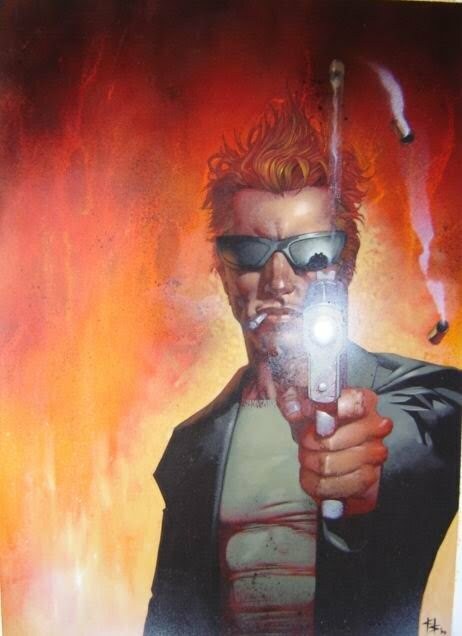 Clint Langley - From Hell! Yikes! 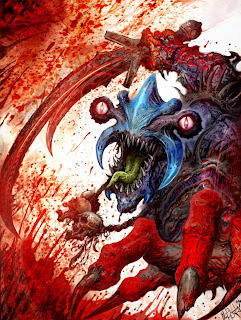 What a gruesome cover from the master of the digital paintbrush, Clint Langley. However, this was a quite a departure from some of Clint's more recent covers so I asked him why he'd chosen a different style. He said "The Red Seas cover was a chance for me to get back to drawing. I've been producing heaps recently but have probably gone 10 years without picking up a pencil, which has something to do with it!" Then it all goes mental! Absolutely amazing stuff, after seeing Clint on robots for so long it's nice to see a good old fashioned monster and a heap of blood and guts! Neil "The Dressing Gown" Roberts - British Gangster! "Shut it you slaaags and listen! 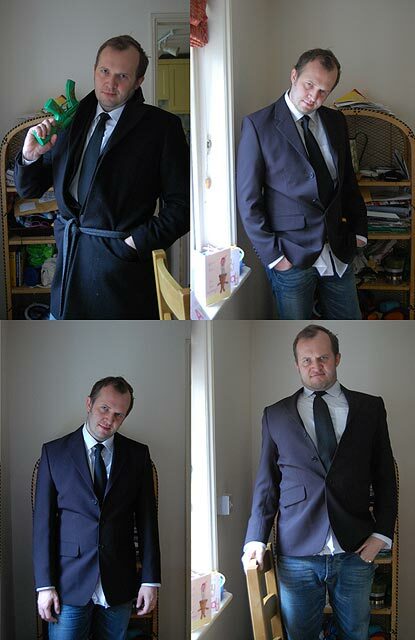 There's a new guvnor on the manor and his name is Neil 'The Dressing Gown' Roberts. When he's not out choking spivs with his dressing gown cord or shooting mobsters with his plastic gun, he's knocking out a decent blog, ain't he?" "The filth have released these terrifying pictures of him. As you can see he's a master of disguise, going from catalogue model to champion gurner in seconds..."
"The rozzers also found these scribblings below, the word on the street is that he was using these to plan something big..."
"Scotland yard have released this terrifying photofit, speculation as to the identities of the figure in the middle and his associates is rife, though it's as easy as ABC to work out that these are going to be trouble in future..."
Ben Willsher - Top Dog! Another winning cover from Ben Willsher, this time for the mouth-watering epic that is ‘The Life and Death of Johnny Alpha.’ As long term readers of 2000AD know, back in 1990, following months of speculation that a major 2000AD character was going to die, Johnny was heroically killed in prog 687. 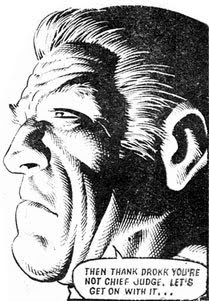 Johnny was killed in an Alan Grant penned story “The Final Solution” which saw the mutants of the UK offered a life of paradise in another dimension through a portal at Stonehenge. The offer was made by the Evil Lord Sagan, who we find out was the illegitimate son of Nelson Bunker Kreelman, which makes him Johnny’s step brother. Of course, the paradise the muties were promised was a lie, and they were expelled to a hellish barren dimension dominated by a “big flying monster.” Johnny was thrown through the portal and faced off against the flying beast using powerful alpha rays from his eyes to read the monster’s mind. This came at a terrible price as the beast burned out Johnny’s eyes, blinding him and leaving him in agony. However, this meeting of minds showed Johnny that the beast was a construct of Ly-ran sorcery and that a blood sacrifice could defeat the beast and open a portal back to earth, allowing the mutants to escape. 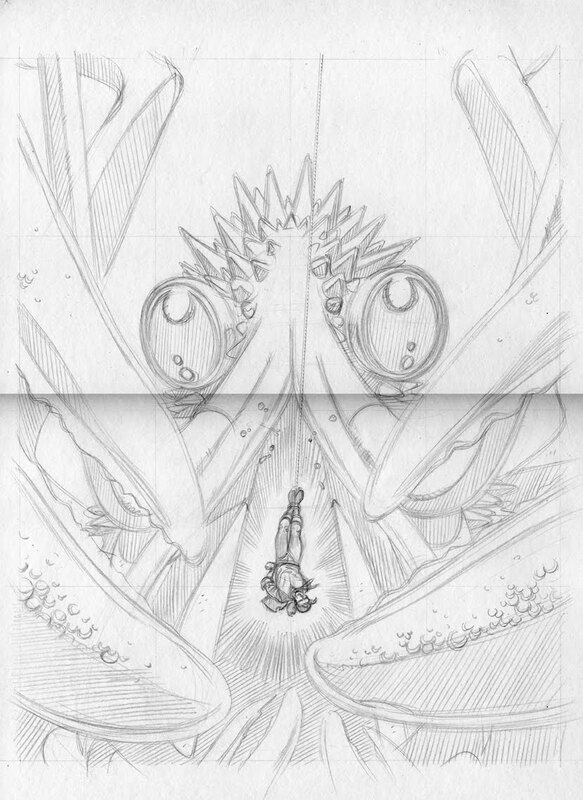 And so it was that Johnny faced the monster a second time, sacrificing himself so the mutants got home… or did he? Twenty year later and Strontium Dog creators John Wagner and Carlos Ezquerra are giving us their version of events. Did Johnny die at all? Over the next few weeks we will find out what really happened! To celebrate the start of the series, we have a terrifying cover by current favourite Ben Willsher who has been kind enough to offer commentary on this and his fantastic Megazine cover. 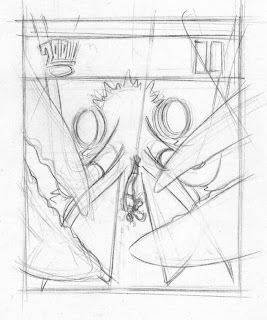 Below we have the roughs, Ben said “Tharg came up with the concept of a 'dead' Johnny Alpha cover. He wanted a head and shoulders shot of the former Master John Bunker in full Stronty armour, but with a skull lurking beneath the helmet. 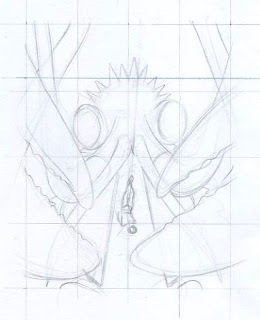 I did these two VERY rough concept pieces (which were little more than thumbnails) one with glowing eyes, and one with merely hollow sockets. The Mighty One favoured the glowing eyes. I’m sure you’ll agree the effort was well worth it. Surely this is a contender for cover of the year? 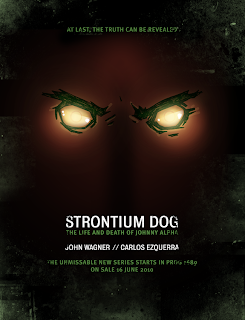 For the sake of completeness, below we have Simon Parr’s teaser poster for ‘The Life and Death of Johnny Alpha’ too, cracking stuff! Speaking of cracking, here is Ben’s iconic, hard-hitting cover for Megazine 299. " 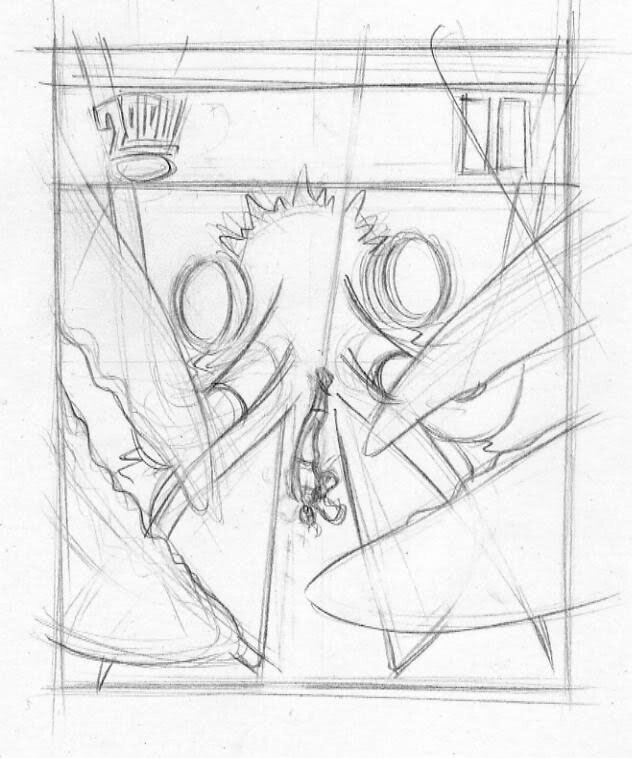 Here is the first concept rough that I sent to Matt. 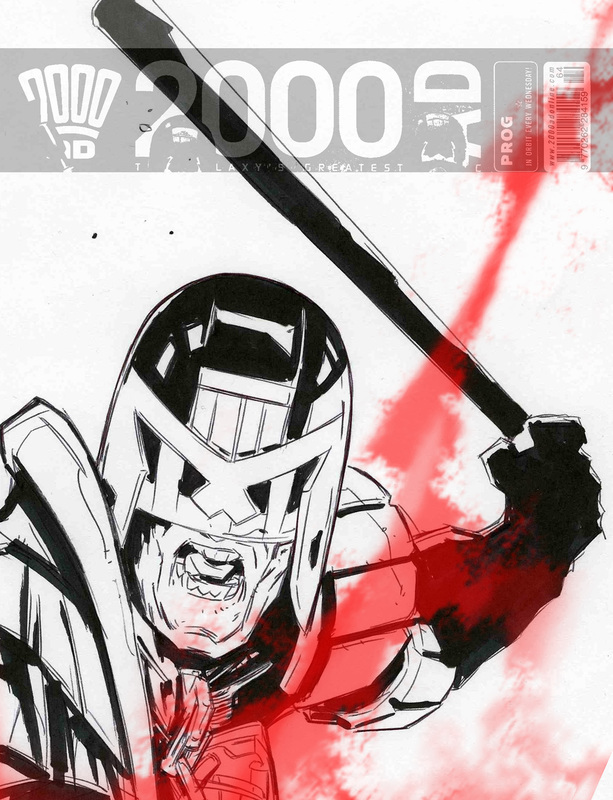 As you can see, it has the 2000Ad banner at the top; however, it was always mooted that it might be for the Megazine. So it is merely used as a generic placeholder graphic, as the Meg and Twothou use about the same dimensions. 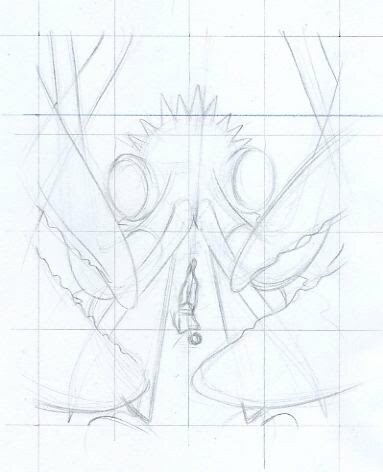 Also note that this initial concept has a blood smear on the 'camera lens', and not a spurt of blood. 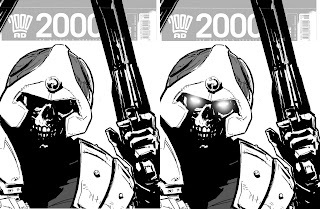 I wasn't sure of the 'blood policy' on covers, so it was always made to be an element of the graphic that we could easily lose. Matt in his wisdom suggested its removal, and instead came up with the idea of smashing the 'lens'. A brilliant idea on his part, as I think it now really sells the imagine of Dredd coming at you with some force." "The next stage is the Black and White art, which then becomes the template for me to start colouring and adding the effects, such as..."
An absolutely superb cover, I'm sure we'll see this image used a lot in the future! Many thanks to Ben for once again taking the time to send his work and give us a fascinating peek into the creative process. Remember to visit his site at http://www.benwillsher.co.uk/index.html. Steve Yeowell - Random Lobster! 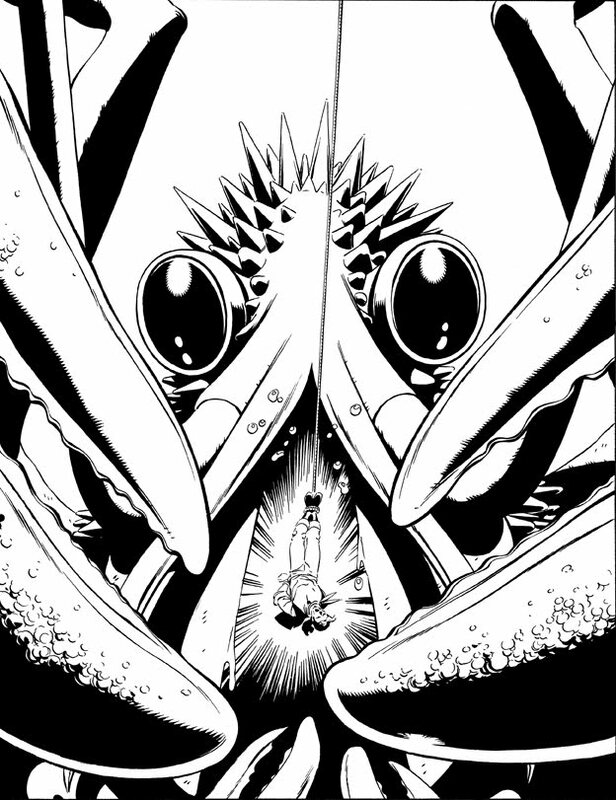 Poor Jack Dancer, he's been dangling in front of that giant lobster since Prog 1623, that's forty five weeks ago now! This is, of course, another brilliant Red Seas cover by the series' celebrated artsit Steve Yeowell. 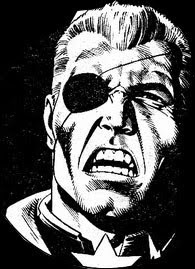 Steve's delicate penmanship was first seen in 2000AD way back in Prog 535, on a little known strip called Zenith. Grant Morrison, the writer of Zenith, had worked with Yeowell on Marvel's Zoids comics and invited him to be the artist on his story of the egotistical British superhero. 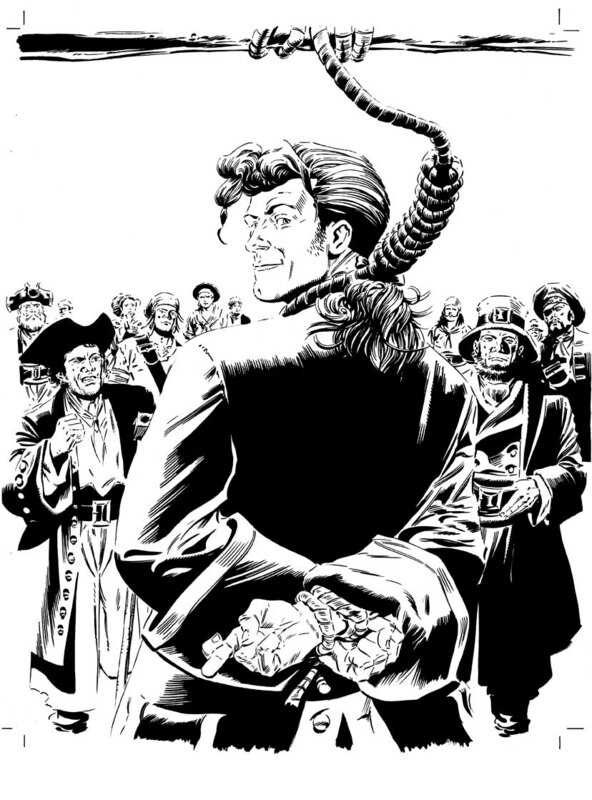 It's worth noting that only three progs after his momentous start on Zenith, Yeowell also provides the art for a Future Shock written by Neil Gaiman! Not a bad introduction, eh? 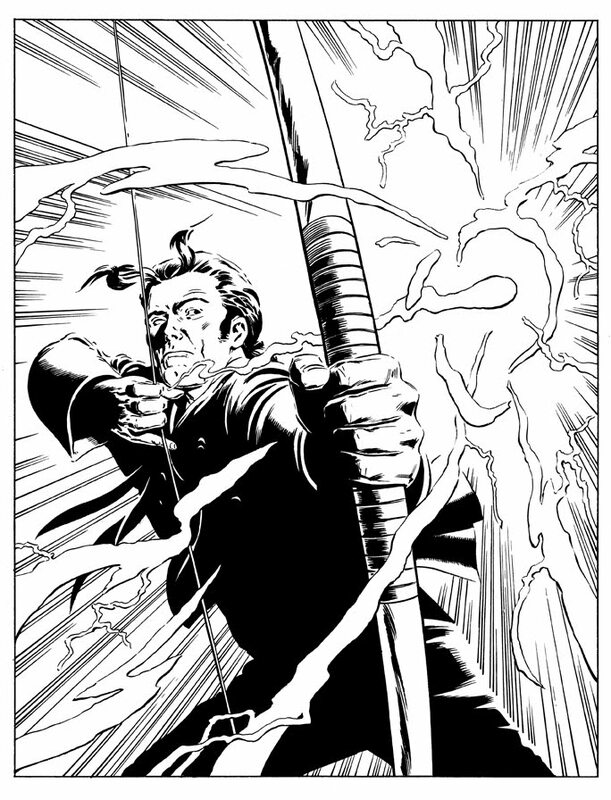 Steve has worked on a large number of strips for 2000AD, including big hitters such as Judge Dredd, Sinister Dexter and Nikolai Dante as well as being the main or sole artist for several titles such as the afore mentioned Zenith, Detinator X, Manic 5, Pussyfoot 5, A Life Less Ordinary, Devlin Waugh: Chasing Herod and most recently, the Red Seas. The Red Seas is a swashbuckling adventure which mainly follows the adventures of 18th century pirate, Jack Dancer and his crew. 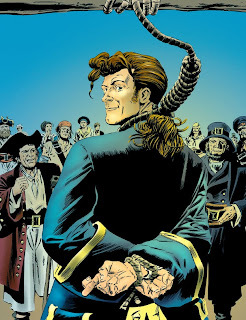 First published in Prog 1313, many readers, myself included, assumed that Tharg was jumping on the forthcoming Pirates of the Caribbean bandwagon. 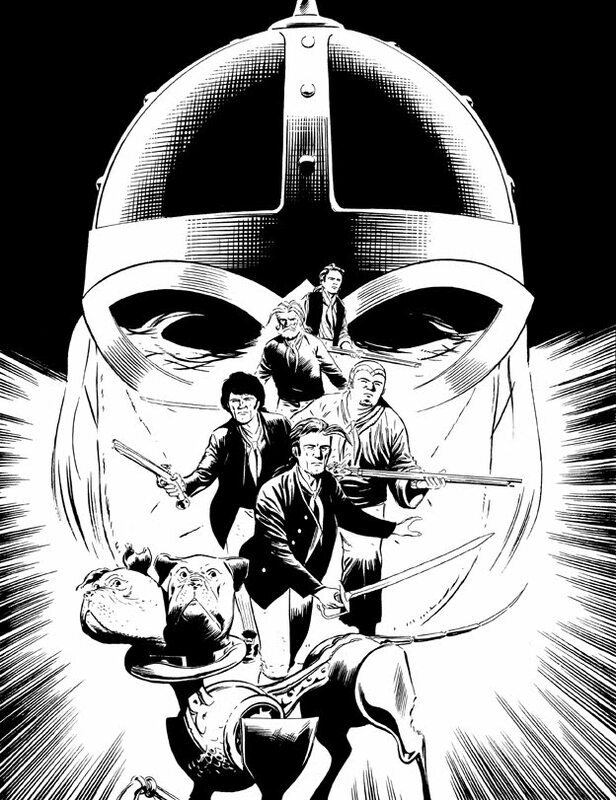 Naturally the mighty one soon proved us wrong as the tale quickly developed into a complex, dimension spanning, time travelling epic featuring themes and characters from writer Ian Edginton's vast universe and beyond. 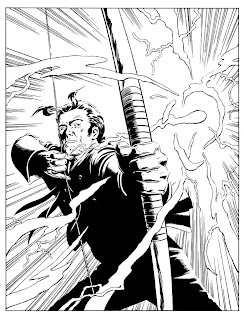 Next we have the pencils and those wonderful inks. 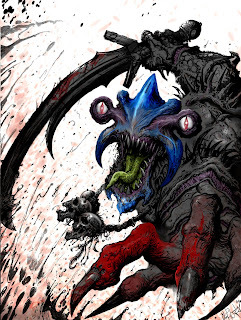 I don't know about you but this cover freaks me out a little, crustaceans always look so dangerous, ugh! The next two images feature the cover for 1460, boasting what I feel is the definitive Red Sea's cover - a cocky looking Jack quite literally up to his neck in trouble. This was the opening episode of "Underworld", a romp where Jack, accompanied by his crew and his half brother Alexander, journey beneath the Earth to find their missing father on the orders of Sir Isaac Newton. The superb cover below, for Prog 1644, shows the great clock who's bell summons the Brotherhood to order. Newton decides to find Jack but is himself kidnapped by the mad Baron of Vulgharia, a robot-making maniac who wishes to discover the secret of Newton's immortality. Sir Isaac discovers that the Baron is working with a resurrected Professor Toten and that there is a traitor within the Brotherhood of the Book. As Toten begins to torture poor Newton, Dancer's beautiful Arabian cousin Captain Sarita, descendant of the great adventurer Sinbad himself, saves the day. 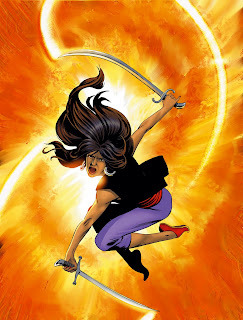 She reveals she was also summoned by Prospero and told to rescue Newton and Dancer. 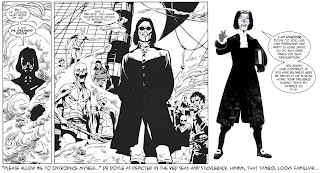 Please note, colours for both the above covers are again by Chris Blythe. So, that clumsily brings us up to date with the Red Seas and allows me to showcase some of Mr Yeowell's amazing covers. Thanks to Steve for sending them, and particularly for getting in touch with Chris to get the coloured version of this week's cover. I'm sure all who are reading this appreciate it as much as me! Simon Davis - Who's your Grandpere?